The full-back was targeted on Twitter after his side’s Champions League exit to Barcelona. Young was targeted on Twitter following United’s 3-0 quarter-final second-leg defeat on Tuesday. The foul abuse of Young brought swift condemnation from United, who said in a statement: “Manchester United utterly condemns racist social media comments posted around yesterday’s Champions League fixture. The 33-year-old was partially at fault for Barcelona’s first goal as his clearance was blocked, leading to Lionel Messi scoring as the hosts went on to win 4-0 on aggregate. 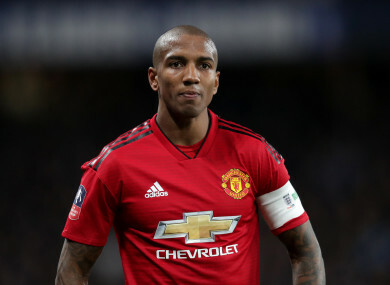 The organisation said via its own Twitter account: “Yet another black player, this time Ashley Young, targeted with racist abuse on social media after tonight’s Champions League game. England’s black players were subjected to repeated chants during their Euro 2020 qualifier in Montenegro last month, while Tottenham defender Danny Rose revealed recently he has “had enough” of racism in football and “can’t wait” to quit the game. Email “Manchester United condemn online racist abuse of Ashley Young ”. Feedback on “Manchester United condemn online racist abuse of Ashley Young ”.